"Jesus, it is for the sake of your love, for the conversion of sinners, for the Holy Father, and to make reparation for the offenses committed against the Immaculate Heart of Mary. Jesus, forgive us our sins, preserve us from the fire of hell, and take all souls to Heaven, especially those most in need of your mercy"
"I saw the Two look at one another, beaming with mutual love. Beams is the right word and barely expresses the radiance of the two Faces." "Your scientists give ponderous explanations of the disgregation and nucleation of cells or of stellar bodies to make the incomprehensible development of the skies human. No. Be silent. Say a single word: GOD. Here is the shaper of those shining, rotating, burning lives! God is the one who, as a warning to you that are forgetful, tells you that He exists by way of the nothern lights, the darting meteors tingeing the ether furrowed by them with sapphire, emerald, ruby, or topaz, the comets with a flaming tail like the mantle of a heavenly queen flying across the firmaments, the opening of the eye of another star in the vault of heaven, and the whirling of the sun perceptible at Fatima to convince you of God's will. Your other inductions are the smoke of human science and envelope error in the smoke. "Everything is possible for God. But as far as you are concerned, know that God requires only faith from you in order to act. You act as a barrier to God's power with your distrust. And your prayers are contaminated with distrust. And I am not counting those who do not pray, but curse. "He cannot!! What is God unable to do? Consider that He made the Universe from nothing, consider that for millennia He has been launching the planets into space and governing their course; consider that He holds back the waters on the shores, and without barriers; consider that from the mud He made that organism which you are; consider that in this organism a seed and a few drops of blood mixed together create a new man, who in being shaped is in relation to the phases of the stars thousands of kilometers away, but also present in the work of forming a being, just as, with their ethers and their rising and setting in your skies, they regulate the sprouting of crops and the blossoming of trees; consider that in his wise power He has created flowers endowed with organs capable of fecundating other flowers for which winds and insects act as pollinators. Consider that there is nothing which has not been created by God, so perfectly created, from the sun to the protozoon, that you can add nothing to such perfection. Consider that, from the sun to the protozoon, His Wisdom has ordered all the laws for life, and be convinced that nothing is impossible for God, who at His ease can have all the forces of the cosmos at his disposal, increase them, halt them, and speed them up, provided His Thought so considers." "How often, in the course of millennia, have the Earth's inhabitants remained astonished at stellar phenomena of inconceivable grandeur: meteors with strange lights, nighttime sun, comets and stars arising like flowers in a garden in God's garden, and being launched into space as if by child's play, to amaze you? Spread of Communism for not heeding Mary's Message to the Pope to consecrate Russia. Then Pope Pius 11th. For the Japanese Souls to Read this: How the Rosary Protected several Jesuits in Hiroshima and a few in Nagaski. "The Power of Mary" Jesus says to make 'friends' with Mary His Mother. Many documented reports about this; don't be foolish not to pray. 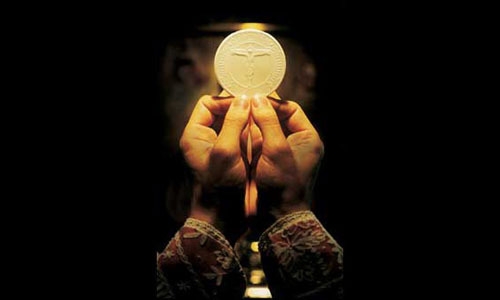 Most Holy Trinity – Father, Son and Holy Spirit- I adore Thee profoundly. I offer Thee the most precious Body, Blood, Soul and Divinity of Jesus Christ, present in all the tabernacles of the world, in reparation for the outrages, sacrileges, and indifference's whereby He is offended. And through the infinite merits of His Most Sacred Heart and the Immaculate Heart of Mary, I beg of Thee the conversion of poor sinners.